Phone at Honda dealer in Georgia "ringing off the hook"
CHAMBLEE, Georgia (CNN) -- Janet McBride had to send someone to fetch lunch for her Saturday. The cheerful auto dealer receptionist didn't dare leave her switchboard during the waning hours of the federal government's "Cash for Clunkers" program. 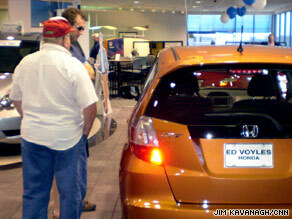 Car shoppers browse a Honda showroom Saturday morning in Marietta, Georgia. "Our phones have been ringing off the hook," said a giddy Pete Richards, general manager of Ed Voyles Honda in Marietta, Georgia. "... It's been great. Phenomenal." McBride was compiling a list of customers for swamped salespeople to call back. "I try to keep it under control," McBride said. "I think we need one of those number things -- 'Now serving Number 5.'" "If I don't do 30 of these today, I'll be amazed," he said. A normal Saturday would produce about 12 sales, he said. The program has generated so much traffic and new-car buzz that even non-qualifying and used car sales have jumped, Richards said. "We're having a ball. I haven't worked a Saturday in probably two years. But I woke up at 3 o'clock this morning. Couldn't wait to get here," he said. "It's like Christmas!" McBride added before her phone rang again. It's more like the letdown of late Christmas afternoon across town at Jim Ellis Chevrolet in Chamblee, Georgia, where General Manager Mark Frost just wants to be done with the headaches the clunkers program has caused. "If President Obama came and sat behind a computer and saw how his program is being administered, he's crack some heads," Frost said. "My impression is that he's about excellence and execution, and there's some dumbass [at the Department of Transportation] sitting there looking at this computer and rejecting deals that are perfectly good." The 12 Atlanta-area dealerships under the Jim Ellis name had made 350 clunker deals worth almost $1.5 million in reimbursements and received payment for none, Frost said. Among those making deals was Mark Gallo, an Atlanta antiques dealer who traded in his eight-cylinder 1998 Chevy van for six-cylinder 2009 model. He received a $4,500 allowance for his clunker, which he guessed was $1,500 more than he would have gotten otherwise. The gas mileage still isn't great, "but it's better than it was," Gallo said. "And I needed a van." He'd been thinking about trading up for a while, but the end of the program prompted him to pull the trigger. "I thought it was going to last a lot longer than it actually did, ... but I saw that it was ending on Monday and I said, 'Oh, damn! Scramble!'" Also scrambling to make a deal Saturday was Rick Wright of Woodstock, Georgia. The ironworker has been working in Orlando, Florida. But when his wife, bus driver Cindy Wright, traded in their 1998 Chevy Tahoe for an '09 Traverse, he needed to be there in person to show his driver's license and sign over the title. "I'm working out of town at the present time, so she calls me up and says, 'Hey, they're going to cut this off at 1 o'clock. Do you want the car?' And I said, 'Let's go for it,'" said Rick Wright, who made the seven-hour drive in time to sign the deal around 10 a.m. Saturday. "That was the only way we could get it done." While the government says the program continues through the end of business Sunday, Frost decreed that the last deal at the Jim Ellis dealerships had to be made by noon Saturday and the paperwork submitted by 1 p.m. in anticipation of continued problems with the CARS submission process. "It's the paperwork that's the biggest pain in the neck," said Jim Ellis salesman Neil Krieger, who sold Gallo his van. Salespeople have been working long hours and making big commissions at both dealerships. "It's been good for me. Oh yeah," the Wrights' salesman, who goes by the single name Kya, said. It's a matter of delayed gratification for the dealers, who will have to wait for the government to sort through the mountainous heap of applications, approve the deals and issue $3 billion in reimbursement. "This could be devastating for dealers if they don't get this going and do this right," Frost said. "A month from now, if all of our deals get paid, then Obama's my hero," he said. "If, in a month from now, if we still have ... $200,000 that we're not getting paid, it's a disaster." Frost worries too much, Honda dealer Richards said. "We're going to get our money," he said. "We're making sure the deals are straight. If everybody's got their documentation right, they've got the buy of lifetime." Despite his concerns, Frost tried to remain optimistic in the program's final hours. After all, his dealership's sales are up 30 percent from last year, he said. "People are coming in," he said not long after opening Saturday. "I smell clunker."